I didn’t find a lot of information about Christopher Gould, but I think he must be from Belgium or France. 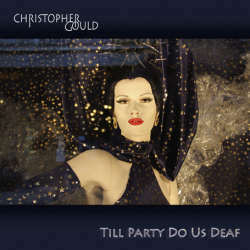 His second album Till Party Do Us Deaf has at any rate good chances of winning an award for the most tasteless cover artwork. Fortunately the music is not as effeminate as the cover might let you expect, but then it didn’t convince me that much either. One reason might be that the album came out 25 to 30 years too late. If you cared to compute, you’ll know that I am talking about the mid-Eighties, a period whose music wasn’t that exciting. The album sounds extremely polished and partly overly synthetic. The production is too clean for my taste, and as a fan of good rock music, I am missing the necessary rough edges. Gould’s music reminds me of artists like Men At Work, Tears For Fears, Alan Parson’s Project, Genesis and Peter Gabriel. The latter’s influence can best be heard on At Your Service, which is experimenting with ethnic music and female vocals. The only really positive surprise if the amazing organ part on Talk Too Much. The rating for this album isn’t that high, but that shouldn’t mean that Till Party Do Us Deaf is a total failure. It’s just that I can’t get any access to this kind of sterile music, instead prefer good, old rock music CDs of which there are more than time allows to listen to.